In the 1970's, along with a resurgence of a new women's movement, came an interest in the Goddess, and there was a surge of books, articles and studies of many of the goddesses throughout history. There was an interest in attributes of the goddess, location, jurisdiction, etc., and of course, lots of different kinds of art. "The Goddess Protects" doesn't come under any of these categories, except that she is a very earthy goddess and I have designated that she protects. What does she protect? 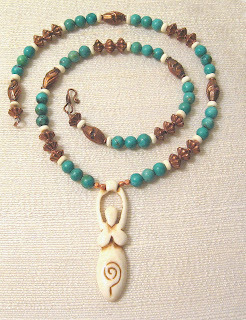 She protects the wearer; she protects all things earthy ~ vegetation, animals, soil, etc. 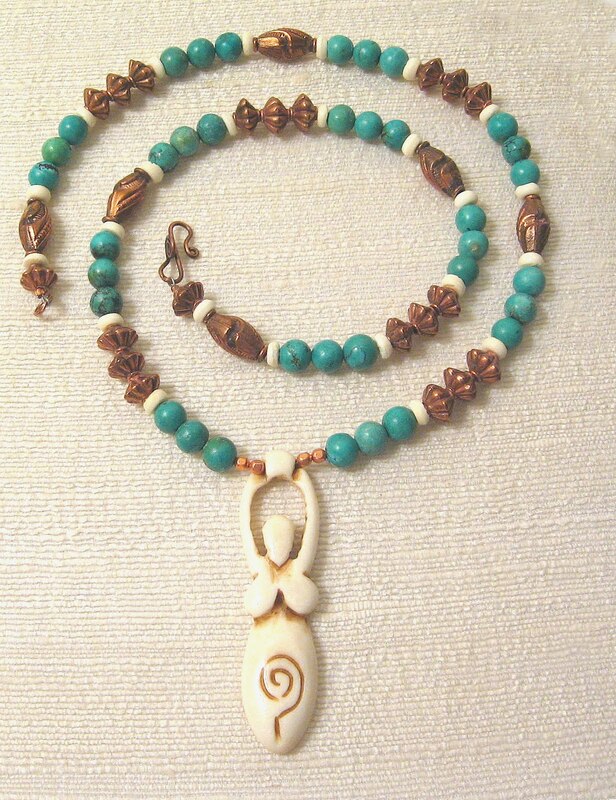 She is also more primal, being made of Bone, Turquoise and Copper. The Bone also places her not only in the present, but in the past as well.